Photo by / courtesy of Visit Azores. We named the Azores one of the in no small part because it offers charming, nature-filled getaways like this one. Need yet another reason to go? It's only four hours from the East Coast of the United States. Take that, jet lag. 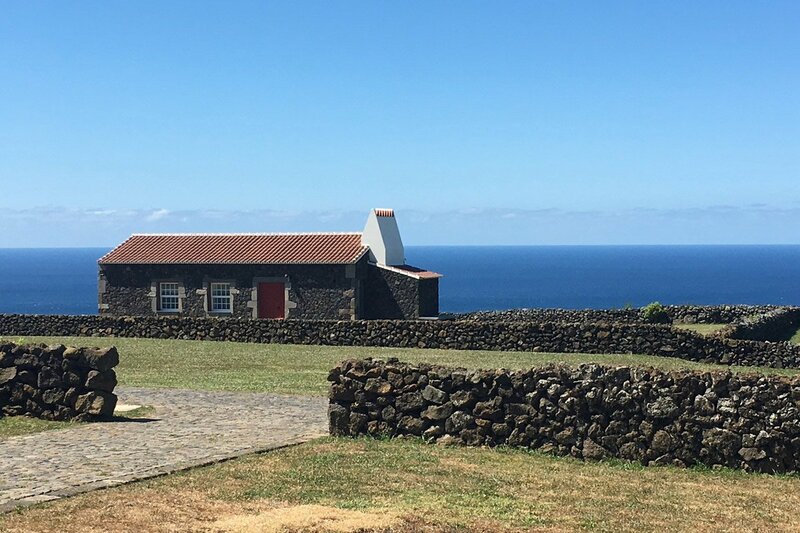 TERCEIRA, The Azores – As we approach the cottages of , we see rabbits frolic on the grass beside meticulously constructed, rustic volcanic stone walls that separate orchards, a greenhouse, and gardens. Hay is rolled in bales; corn waves in the breeze. Cows of various hues idle across the landscape. Okay, I’ve found it: This is where I’ll come to wait out the apocalypse. I was on Terceira Island, in the central group of the Azores, to lecture at an earth science workshop and participate in a weather measurement field campaign. My extended family joined me for an excellent weekend of cottage living, nature activities, and delicious food in an affordable destination where English is widely spoken. Cottage bliss. Photo by Julie Pullen. Photo courtesy of Pico da Vigia. Pico da Vigia is a stunning enclave of stone cottages opened about a year ago on the edge of Terceira island in the Azores. 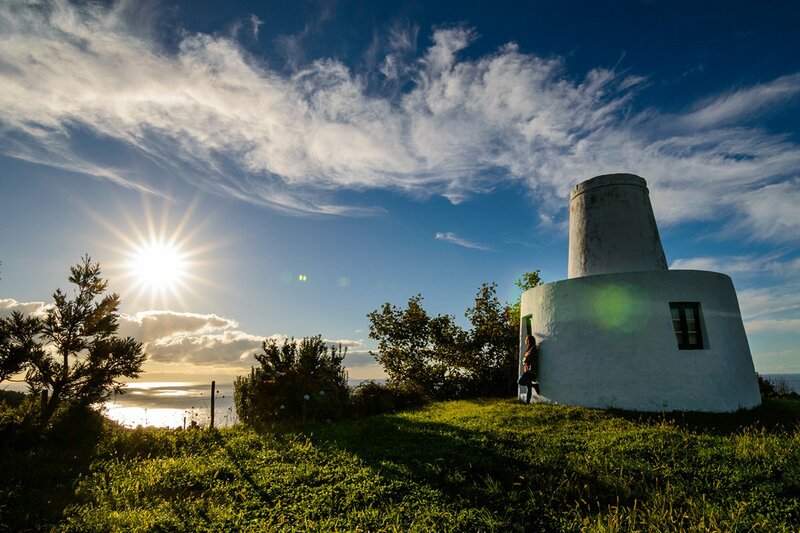 The name means “lookout point,” an appropriate nod to Atlantic Ocean views that go on for miles, which allow for excellent whale-watching from the supreme comfort of its cottages. From the outside, the six spacious stone cottages draw on elements of the rural island’s agrarian history. Inside, they embrace the future with amenities and design features from local artisans and Portuguese architect . Owner/managers Bruno Gonçalves and Sofia Couto carefully constructed the stone cottages with simple exteriors and layouts inspired by the past, but imbued with contemporary interior design and bones – think Shaker-like furniture, waterfall showers, and huge stone bathtubs. The cottages have patios for gazing out to sea or up at the stars. An expansive sunken swimming pool is situated on the slope above the cottages. Our family took over the large one-bedroom (yellow), and two-bedroom (white) cottages. 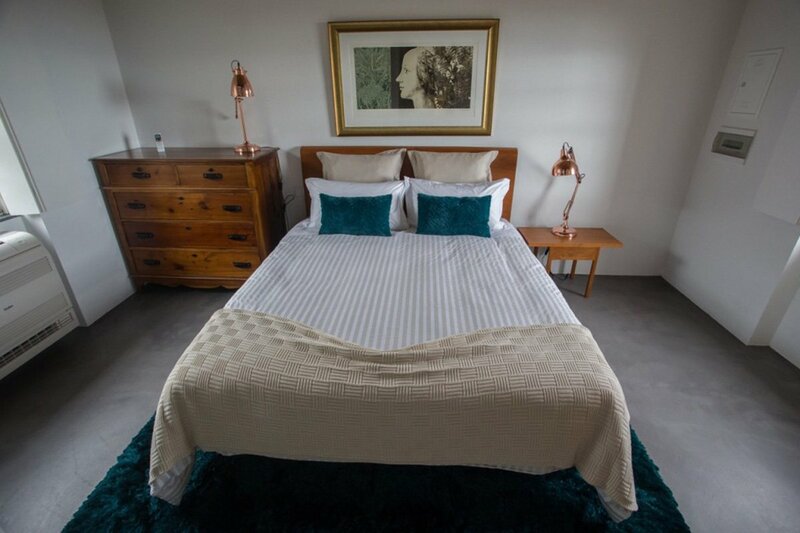 The white cottage, with a bedroom on either end and two bathrooms, was perfect for a family of four. All the cottages are trimmed in a color that continues throughout the interior. Edgy local art offsets the traditional linear layouts of the cottages. Every morning, delicious — and still warm — bread appears in a basket through an enchanting small window wreathed in sunshine to accompany other breakfast items stocked daily (like milk, yogurt, eggs, meats, cheeses, and cereals). 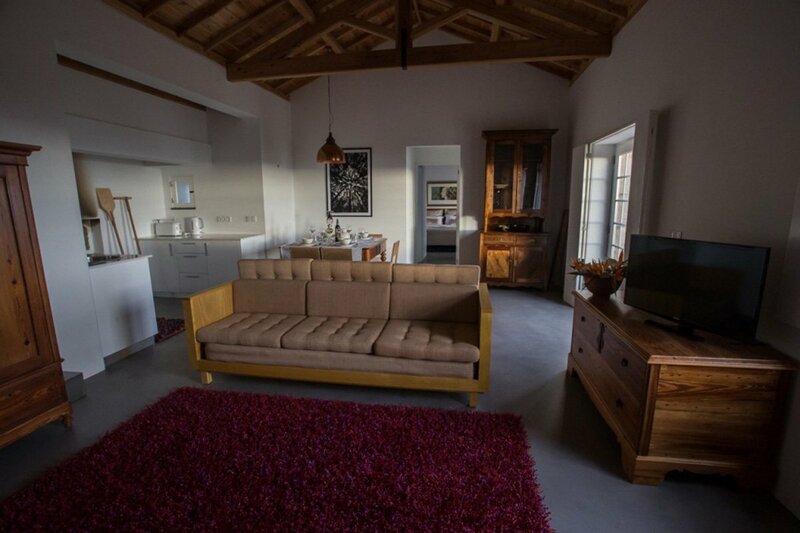 A brick fire oven and sleek kitchen appliances round out the accouterments. The kitchens are well equipped for whipping up a meal — fortified with fresh salad and onions delivered from the gardens — without leaving the premises. Families, couples, and multi-generational gatherings will appreciate the bucolic surroundings and nearby activities. 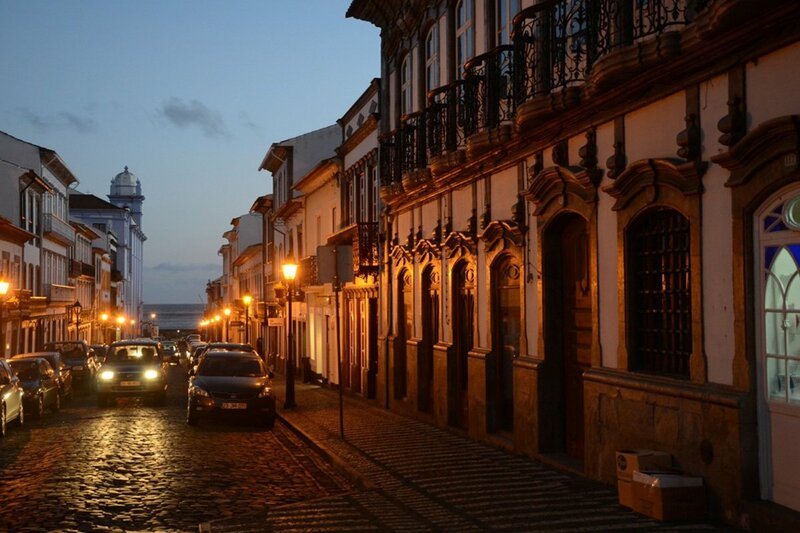 Though Terceira is the third largest Azorean island, it can be traversed in about 45 minutes. Those seeking an active nightlife on the premises might find it a bit tame. This place is about communing with the stars and good company in the evenings. Angra do Heroísmo. Photo by Floreesha / Courtesy of Visit Azores. Terceira has fascinating walks where you can discover how the volcanic origin shaped the landscape. The story the lava tells dominates the history of the island. The subterranean cavern and visitor center at and the field of gaseous emission at nearby Furnas do Enxofre are in the center of the island. Misterios Negros – giant lumps of lava – make for a unique hiking destination. 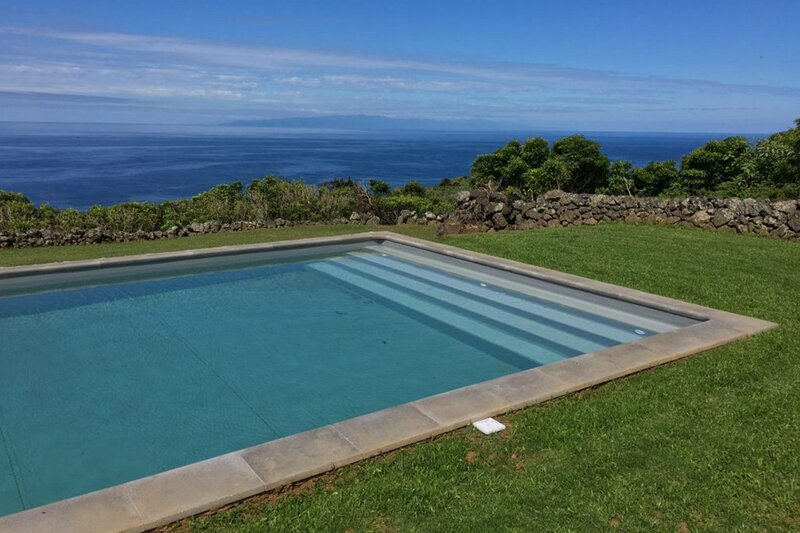 From the cottages you can survey the neighboring islands of Sao Jorge and Pico, also in the central group. Both are about a 20-minute flight from Terceira. 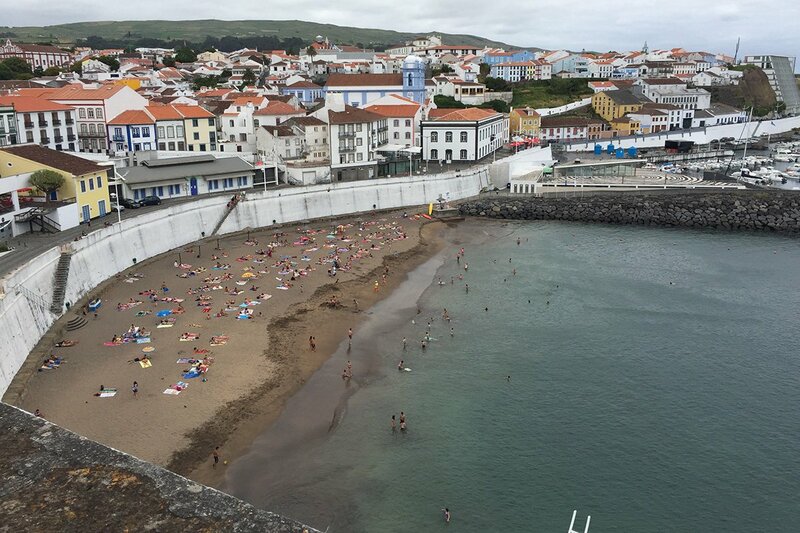 Every Azorean island is unique and deserves a visit. We lingered on the beach at Praia da Vitória on the island’s east side, which has several stretches of well-maintained sand in the harbor. The water temperature is bracing, even in the summer, so this is not a typical beach destination. But my tween kids found the sand perfect for building whimsical sand structures, and the Praia promenade is vibrant with gelato stands and cafes. The main town of Angra do Heroismo is a UNESCO World Heritage site, with 18th- and 19th-century churches, government buildings, a fortress, shops selling traditional embroidery, local goods, and wines, and a small beach on the harbor downtown. Angra do Heroismo. Photo by Julie Pullen. If you're lucky, you'll see a bull run. Photo by Julie Pullen. One of the more arresting island activities is the bull run, a favorite activity for young and old alike that has persisted for hundreds of years. 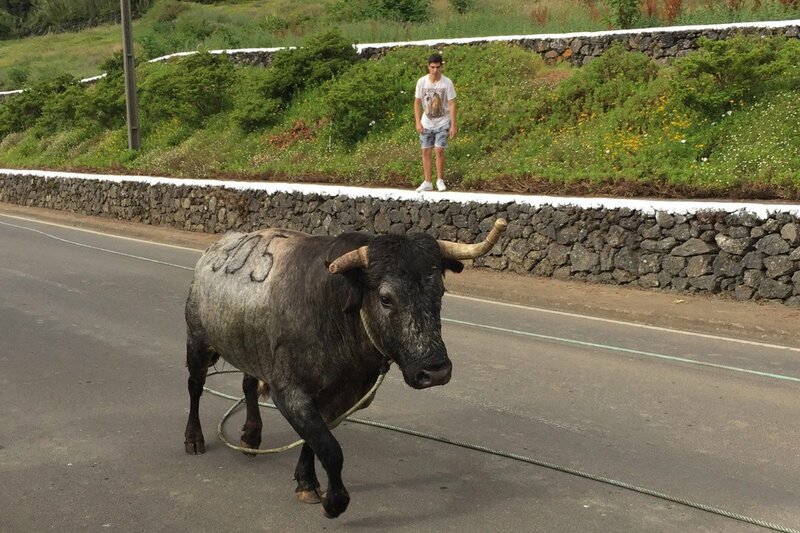 On many evenings all summer long, farm-owned bulls are sequentially let loose in the streets of villages across the island, loosely tethered by trained minders who keep the bulls on the move through the streets. The event has the feel of a block party, where homeowners open their doors to friends, strangers, and roving musicians, graciously offering food, drink, and safe haven from the pummeling bulls. Bruno’s daughter and father-in-law chaperoned us and illuminated this exciting community gathering, explaining how on Terceira, even young children are taught how to evade a raging bull and to plan escape routes. offers personalized zip lining and rappelling excursions down a riverbed cutting through the steep terrain. Spending a half-day or more on this course is great for active families. High-quality are ubiquitous across the Azorean central islands, which are known for their permanent sperm whale and migrating whale populations drawn by the fertile feeding grounds. Angra do Heroismo at sunset. Photo by Vincent Bresmal / courtesy of Visit Azores. There are several restaurants in the town of Santa Barbara (about 1-2 kilometers away). 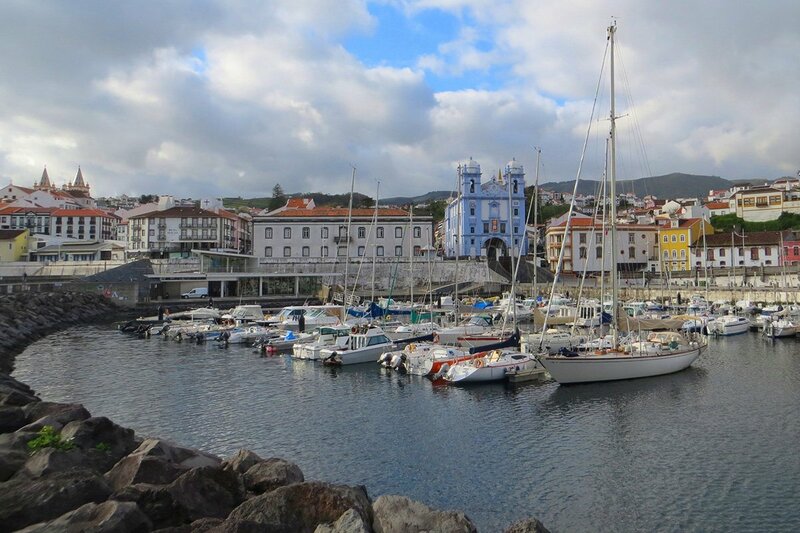 Slightly farther afield are the well-known fish restaurant (15 minutes) and many options in the main town Angra do Heroismo (25 minutes). There, was a stylish favorite where we dined on barnacles and discovered our favorite local rosé from Faria’s Vineyard (Pico Island). Past Angra on the waterside of Praia da Vitória are design-forward R2 and that became our go-to places. Service is warm and gracious across the island. Sustainably caught and incredibly fresh local seafood is found everywhere. If you like octopus, you'll want to sample the many ways it's prepared here. Azores Airlines (previously called SATA) offers flights between the islands and internationally. From the United States and Canada, affordable non-stop flights originate from Boston (BOS) and Toronto (YYZ) year-round, and from Oakland (OAK) and Montreal (YUL) during the summer. From Boston, the flight time is around four hours. There are also non-stop flights from Europe. The Azores are an autonomous region of Portugal. The currency is the euro. Vivian Brigham contributed to this story. Был найден мной авторитетный web-сайт , он описывает в статьях про https://ford.niko.ua.